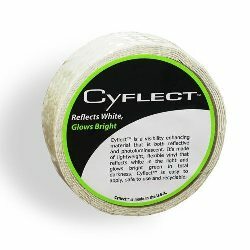 Cyflect Adhesive Glow in the Dark Reflective Honeycomb Tape 1.5" X 150' make steps, stairs, doorways and exit routes clearly visible. With a patented technology that both glows in the dark and reflects lights, CyFlect® is a unique industrial tape with adhesive applications. A short charge in the light is all that is needed to light the way to safety.